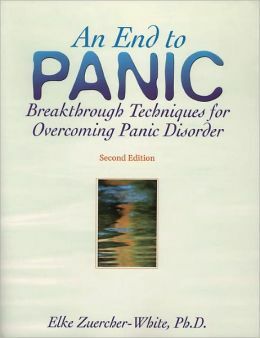 Dr. Zuercher-White’s An End to Panic has been awarded The Association for Behavioral and Cognitive Therapies Self-Help Seal of Merit — an award bestowed on outstanding self-help books that are consistent with cognitive behavioral therapy (CBT) principles and that incorporate scientifically tested strategies for overcoming mental health difficulties. Used alone or in conjunction with therapy, the book offers powerful tools readers can use to jump-start changes in their lives. Peters, J. (Chair), Gonzales, P., Harris, L., Richman, D., Schreiber, G., Sisova, N., Spence, R., & Zuercher-White, E. (1995). Clinical Practice Guideline for the Treatment of Panic Disorder in Psychiatry. Oakland: Kaiser Permanente. Zuercher-White, E. (1995). An End to Panic: Breakthrough Techniques for Overcoming Panic Disorder. Oakland: New Harbinger Publications. (1998) 2nd Ed. Zuercher-White, E. (1997). Treating Panic Disorder and Agoraphobia: A Step-by-Step Clinical Guide. Oakland: New Harbinger Publications. Zuercher-White, E., (Clinical Guideline Leader), & Wilson, P. (2001) Clinical Practice Guideline for the Treatment of Panic Disorder in Psychiatry, 2nd Ed. Oakland: Kaiser Permanente. (Updates 2003, 2005, & 2007). Zuercher-White, E., (Clinical Leader & Project Manager of Guideline), Gonzales, P., Kahn, J., Manzano, N., McMahon, E., Wetter, M.G., LaRocca, P., & Ray, K. (2001). Clinical Practice Guideline for the Treatment of Obsessive-Compulsive Disorder in Adults & Children.Oakland: Kaiser Permanente. Zuercher-White, E., (Clinical Leader & Project Manager of Guideline), Diamond, R.P., & Ringo, D. (Updates 2003, 2005, & 2007). Clinical Practice Guideline for the Treatment of Obsessive-Compulsive Disorder in Adults & Children. Oakland: Kaiser Permanente. Pollard, C.A. & Zuercher-White, E. (2003). The Agoraphobia Workbook. Oakland: New Harbinger Publications. Zuercher-White, E., (Clinical Leader & Project Manager of Guideline), Diamond, R.P., McMahon, E., Peters, J., Van Allen, P., & Windstrom, D. (2007). Clinical Practice Guideline for the Treatment of Social Anxiety Disorder in Adults & Children. Oakland: Kaiser Permanente. 1998-2008: Was invited to be Chair of the Anxiety Disorders Best Practices for KPNC. As such, chaired the production of guidelines for Panic Disorder, 2nd Ed., Obsessive-Compulsive Disorder, and Social Anxiety Disorder (see publications list above). In this capacity, led the Anxiety Champion Group, provided training and support for therapists treating clients with anxiety disorders, promoted regionally the identification and treatment of these disorders, and organized workshops in various anxiety disorders. 1994: Was invited to participate in the Anxiety Disorders Best Practices for KPNC to produce the Clinical Practice Guideline for the Treatment of Panic Disorder in Psychiatry, published in 1995 with Dr. John Peters as chair. 1993: Initiated the Anxiety Disorders Work Group for the Kaiser Permanente Northern California Region (KPNC), later the Anxiety Champion Group. 1988: Started the Anxiety Disorders Program at South San Francisco Kaiser (CA) with a Panic/Phobia Group. Later the program was expanded to include group treatments for Obsessive-Compulsive Disorder and Generalized Anxiety Disorder. At various times led a New Panickers Group, Social Phobia Group, Worry Group, Teen Anxiety Group, Senior Anxiety Group, and Spanish Speaking Depression/Anxiety Group.